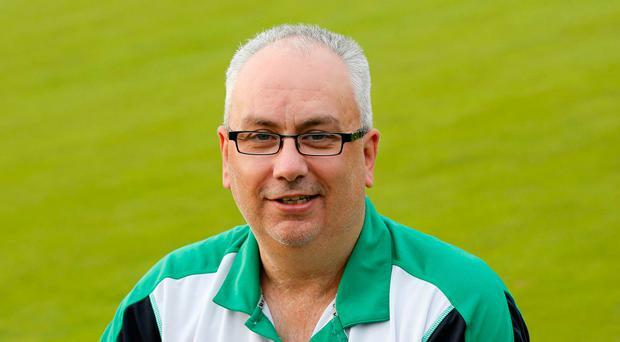 It was a case of so near, yet so far for Ireland as they blew their chances of winning the British Home International Bowls Championship for the first time since 2009. They approached the final day at sunny Leamington Spa in the best possible shape, having just delivered a magnificent victory over England, leaving the reigning champions well and truly on the ropes. It was a wonderful response from Neil Booth's side who fell to a narrow defeat to Wales in their opening game on Saturday morning, beaten by 12 shots. But they quickly shrugged off that disappointment to produce one of the most impressive performances for many years against the English, storming to an astonishing 36 shots victory - a result that put them right back on title track. It meant they went into yesterday's final session needing to defeat the Scots, who had lost their opening two fixtures, while Ireland were also looking for a favour from England to beat the Welsh. Ironically, the English kept their part of the equation, recording a 21-shot victory, only for Booth's boys to blow it when it really mattered. Although only 16 shots separated the teams at the finish, the Irish were playing catch-up practically from the off and, at no time appeared confident reeling in their inspired opponents. "It was a disappointing way to lose it," admitted team boss Booth. "The boys went into the game on such a high after the display the previous day against England. "But we came up against a Scotland side that had something to prove, having lost their two games on Saturday. It's a big chance lost, but there were many pluses to take from the team's performance over the two days. "It's a sound platform to build on and I've not doubt we'll come back strong next year." Wales eventually paraded the title for the first time since 2012, pipping England on shot advantage. Ireland had to settle for a disappointing third-place finish. Results: Scotland 121 Ireland 105 (B Mellors 25 S Coleman 15, D Oliver 14 S Martin 22, I McLean 17 I McClure 14, G Logan 22 M McHugh 13, C Walker 19 G Kelly 20, P Foster 24 A Kyle 25). England 128 Wales 107 (R Paxton 20 S Harris 23, D Bolt 24 P Taylor 17, J Walker 18 R Owen 13, J Chestney 25 D Doubler 12, S Tolchard 24 M Wyatt 17, S Farish 17 J Tomlinson 25). England 123 Scotland 106 (S Tolchard 26 C Walker 12, S Farish 13 P Foster 19, R Paxton 14 B Mellors 18, J Walker 17 I McLean 30, J Chestney 30 N Spiers 13). Ireland 107 Wales 119 (G Kelly 21 M Wyatt 13, A Kyle 16 J Tomlinson 13, S Coleman 16 S Harris 28, S Martin 20 P Taylor 24, I McClure 16 R Owen 16, M McHugh 18 D Doubler 15). England 98 Ireland 133 (J Walker 11 I McClure 30, J Chestney 17 M McHugh 19, S Tolchard 16 G Kelly 18, S Farish 15 A Kyle 27, R Paxton 15 S Coleman 19, D Bolt 24 S Martin 20). Wales 136 Scotland 90 (R Owen 25 I McLean 10, D Doubler 19 G Logan 20, M Wyatt 21 C Walker 14, J Tomlinson 22 P Foster 17, S Harris 28 B Mellors 11, P Taylor 21 D Oliver 18). Final positions: 1 Wales 4pts (+37 shot difference; 2 England 4pts (+3); 3 Ireland 2pts (+11); 4 Scotland 2pts (-51).